The new Rio-class container vessels visiting Port Chalmers weekly are causing sleepless nights for some residents, because of large, noisy generators aboard the bigger ships. The issue has prompted the port company to begin noise assessments at its various wharves and look for ways to mitigate the problem. 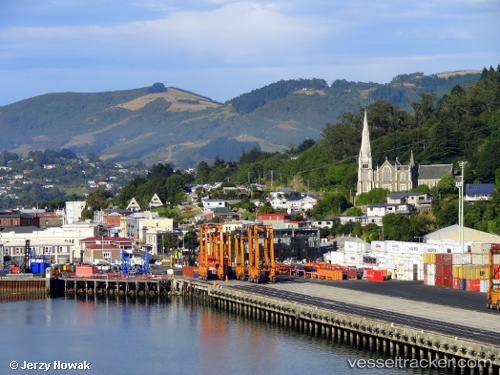 Port Otago is going to put out tenders shortly in preparation for a $15 million 140m wharf extension at Port Chalmers, to better accommodate vessels over 280m in length. The venture was one of several presented to 100% owner the Otago Regional Council, where port chairman Dave Faulkner and chief executive Geoff Plunket yesterday outlined a number of projects in its three-year plan to mid-2019. Consent for the wharf extension was gained under Port Otago's "New Generation'' dredging project, and would result in 140m being added to the existing 300m wharf, using steel piles, capped by a reinforced concrete slab. Mr Plunket said after the meeting the existing container terminal berth was "ideal'' for vessels under 280m, while the outer multipurpose berth extension would cater for vessels of more than 280m in length; allowing cranes ready access to bow and stern-stored containers. Speed was a factor in a straddle carrier crash which seriously injured a Port Otago worker in July, a Worksafe NZ report says. The worker, whose name was suppressed in the report, was travelling 8kmh above the recommended speed limit when turning a corner in the machine on July 1. He suffered serious injuries but returned to work before Christmas. The recommended speed limit for a straddle carrier when turning a corner was 12kmh, the report said. The worker had been travelling at 20kmh at the time of the incident. The worker was making a 180 degree turn to back the machine under a crane when it toppled over and landed on its left side. The 26-year-old man was working on loading cargo onto the container ship Medinah at the time of the incident. He started work at Port Otago in 2006 and became a full-time cargo handler in 2008 after completing a qualification in forklift and straddle driving, the report said.